80% of people agree that eating healthy and providing your body with all of the nutrients it needs requires sacrifices. There’s no doubt that eating healthy requires commitment and focus, and that it is difficult sometimes, especially when you’re busy or want to treat yourself to tasty food and drink during a special occasion. However, when you’re celebrating something as special as your birthday, there are ways in which you can celebrate while still enjoying a delicious detox that won’t send you off the rails completely. Whether you’re turning 50 or simply want to go all out for a birthday that is special to you, there are plenty of fun party themes that are suitable for healthy parties. You can, for example, plan a party theme that focuses on dancing off the calories you’ll consume later or even one that incorporates your detox diet into the fun. These can be as intricate and involved as visiting a fresh fruit farm for the weekend and enjoying the getaway with friends or as simple as planning a staycation yoga retreat with healthy refreshments afterward. If you are looking for something more active, plan a high-energy dance party or rent a party pedal bike to have fun while burning off the calories you’ll be eating later in your vegan birthday cake. However you choose to celebrate yourself, it’s important that you plan a party that makes you feel comfortable and allows you to still engage in your lifestyle and eating habits without feeling guilty. 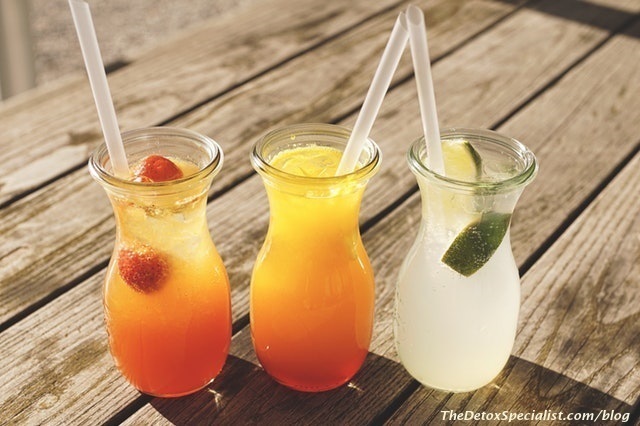 When detoxing, you’ll definitely be forgoing the alcohol, but that doesn’t mean you can’t still enjoy the taste. There is a wide variety of delicious drinks that will taste just as good as the “real thing” even without adding the alcohol. Think about all of the fresh fruit and juice you can use in mocktails and then get excited about what you’ll accompany them with. Hummus, homemade guacamole, and other all-natural foods are great party snacks and can be consumed without too much guilt. If you feel like you absolutely must treat yourself to an adult beverage during your birthday celebration, it’s important to remember that alcohol and fasting can be dangerous, but also that the American Heart Association even says that consuming one drink per day for women and two drinks per day for men is absolutely fine. However, it’s still best to opt for an all-natural smoothie that’s jam-packed with nutrients and antioxidants. It will give you more energy to continue the festivities late into the night without having to worry about a hangover. Spending another year around the sun is something to celebrate for sure, and even more so if you’ve made it a year of self-improvement and dedication to a healthier you. Enjoy celebrating yourself and all of the hard work you put into leading a healthy life; you’ve deserved it. Throwing a big birthday bash doesn’t have to mean undoing all of the hard health work you’ve done and it certainly doesn’t have to be unhealthy in any way.